The car chase is the thing batman should do perfectly. He often pursuits villains that are trying to disappear and the driving skill does matter here. Avoid the traffic and collect bonuses that will increase your speed and movements. 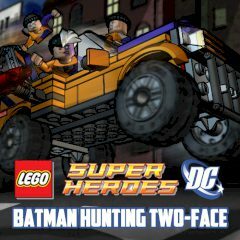 Chase the Two-Face and avoid the traffic and the obstacles on the road that can cause a car accident. Don't let yourself lose precious seconds that can be used to get closer to the bandit. Drive fast and change lanes to avoid traffic or to collect bonuses that will increase the speed of the Batmobile and get you closer to the destination point. Monitor the position of villain and don't let him escape the justice!